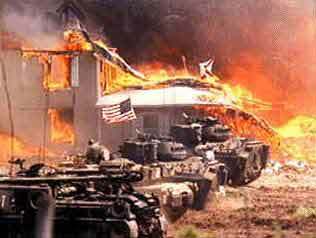 The Waco massacre, 15 years ater: Never again! The Waco massacre, 15 years later: Never again! On February 28, 1993, federal agents from the Bureau of Alcohol, Tobacco and Firearms agents raided the Branch Davidian compound in Waco, Texas. Heavily armed men wearing body armor and armed with assault weapons invaded through the windows, tossing in smoke grenades while BATF agents provided cover fire. Who fired the first shots remains a subject of debate, but there is no doubt that the raid provoked a completely unnecessary confrontation. It also represents a frightening example of excessive force. What exactly did the BATF think would happen, when heavily armed men armed with assault weapons storm the compound of a heavily armed doomsday cult that expected an eventual confrontation with the government? How did they expect the Branch Davidians to react as these men invaded through the windows of their home? The BATF was repelled, and a standoff ensued. The federal government blared music over loudspeakers, trying to disrupt the Branch Davidians ability to sleep and irritate them into giving up. 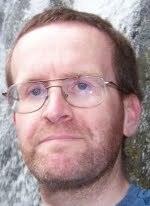 This foolish tactic, which would be condemned by some as torture if used on Islamic terrorists in Guantanamo Bay, probably increased the resolve of the doomsday cult and may have contributed to the violent end of the confrontation. And then, on April 19, 1993, Janet Reno had decided she had enough and ordered a second raid on the compound. This time, military force was used to invade and subdue the compound. I vividly remember tanks attempting to break through the walls of the compound on that fateful day, and the spectacular fire that followed. 76 people, including 21 children and two pregnant women, perished in the fire that obliterated the Branch Davidian compound. President Bill Clinton authorized his attorney general, Janet Reno, to make a decision about the standoff. Reno's decision was to use military force on American citizens who presented no imminent threat to their neighbors or to federal forces standing watch outside the compound. 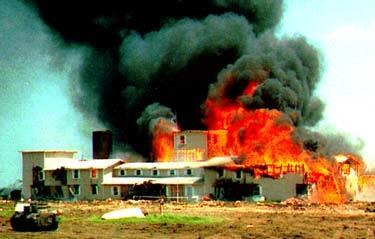 It is entirely possible that the Branch Davidians were waiting for an excuse to literally go out in a blaze of glory. It may well be that this disaster became unavoidable the moment the FBI launched that ill-conceived and unnecessary raid on February 28. But our government had an obligation to wait as long as was necessary for a peaceful resolution. The use of military force on American citizens who are not actively engaged in rebellion is unacceptable and remains a threat to our civil liberties 15 years later. There are all kinds of conspiracy theories about Waco and what really happened when 76 people died on April 19, 1993. But one doesn't need to be a conspiracy theorist to recognize that Waco is an example of how dangerous the federal government can be to our civil liberties and why federal power must be held in check by the states. Sadly, the federal government has slowly and steadily grown in power, while government's reach into our lives, our businesses and our wallets gets deeper and deeper. Now, President Clinton's wife, Hillary Clinton, is running for President of the United States. If she wins, the administration responsible for Waco, not to mention the 900 FBI files on political opponents in the White House, will effectively have a third term. And who can forget the unnecessary use of paramilitary tactics used by the Clinton administration to capture a little boy named Elian Gonzalez eight years ago? Who can forget the image of an assault weapon pointed directly at a child? Can you imagine this woman having the expanded powers that the War on Terror has given to the executive branch, especially with the Patriot Act? Thankfully, it appears that Barack Hussein Obama will be the Democrat Party's nominee for President. This will probably end Mrs. Clinton's efforts to be President. As bad as Obama might be, at least he's not a Clinton.